From November 27-29th we have had our first-ever Brazilian National Selection held in the Federal University of ABC (UFABC), who has now completed 2 years of involvement in the IPT competitions. Teams from UFABC and USP made really interesting Physics Fights during the competition that happened on both university’s campi. 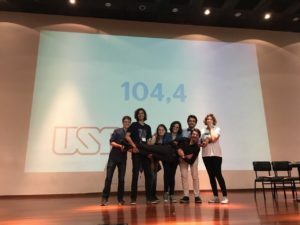 Selective fights in Santo André showed balanced debates and solutions, and the final in the São Bernardo Auditorium showed the maturity and hard work from both teams to prepare for the competition. 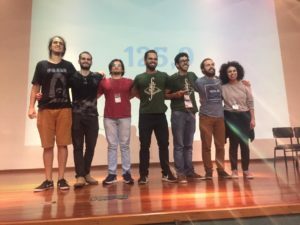 At the end of the Brazilian National Selection (BNS), UFABC (125.9) prevailed over USP (104.5) and will represent the country in Lausanne for the third time, in the XI International Physicists’ Tournament that will be held in École Polytechnique Fédérale Lausanne (EPFL), winners of the X edition. We would like to reinforce the great atmosphere that took place during the 3 days of competition and nice relationship between both teams showing empathy and sympathy for an awesome competition. Special thanks to Henrique Ferreira, Ricardo Gitti, Antonio Neves, Ronei Miotto, Wagner Carvalho, the presidency of UFABC, the Rectory for Extension (PROEC) and all 20 volunteers that made the Brazilian Tournament happen.